It’s always a treat to show our guests a certain postcard displayed in the stores of Pienza or Montepulciano or any of the other small towns located in or around the Val d’Orca, Tuscany. There’s this picture-perfect little farm which sits on the top of a hill, complete with a tiny chapel which was probably used by the wealthy farmer who built the compound. A pullover has been created to accommodate shutter bugs (like us) who want to stop and see if they can do as well with the scene as the photographers who have created everything from placemats to magnets from the scene. 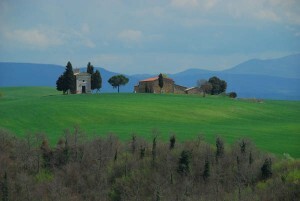 The farm is along the main road connecting Pienza with Montalcino. James what can I say? You went above and beyond and almost to JAIL to accommodate my need to visit the W/C…who knew a visit to the loo would result in such a fiasco? It’s an awesome story….with a happy ending….no jail time for you and I was able to see St. Peter’s stunning interior. I must admit though…watching you being chased by the security guard left a cuss on my lips and a lump in my gut.